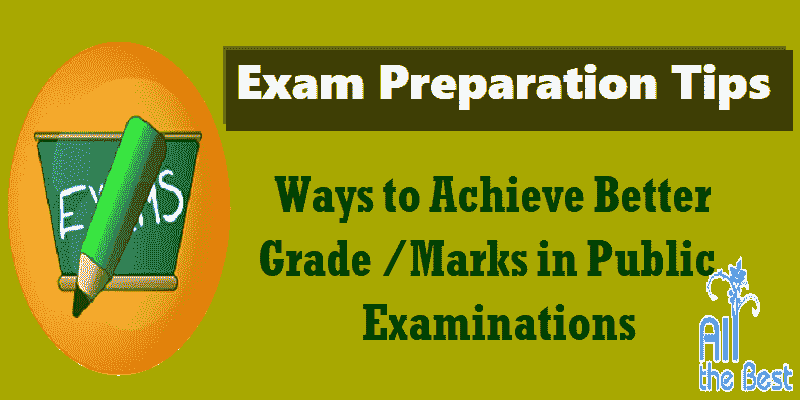 Exam Preparation Tips| Ways to Achieve better Grade /Marks in Public Exams: Important Exam Preparation Tips, Ways to Achieve better Marks in Public Exams, Preparation Tips for Exams, Follow the useful exam tips and succeed in your Exams, Some useful tips for preparing for exams, How to achieve success in exams, How to prepare for exams. 1st January - new year celebrations. we have entered new year with lots of hope to achieve our goals. when we entered into February, students face lots of tension because they are going to celebrate festival of exams. They will mainly suffer from fear, which is very dangerous. We can achieve any thing, if we overcome fear. So, Follow these tips and succeed in your exam. It may be tenth or inter, CBSE +1 +2 it may be any exam you can be topper in that. Syllabus of tenth & Inter have been completed already now its the time for revision it is better to revise than spare time in learning new topic to get good results. Short notes including main points will help you more. This year tenth class curriculum changed as CBSE also changed the questions are based this time questions may be on contemporary issues related to subject. Questions in any subject will be concept based .you have to understand the concept and answer, describe in your own way. Now the questions are based on the competency observation .questions will be asked on the basis of observation of table ,chart ,graphs, diagrams etc. YOU have to answer the questions describing, analyzing, simplifying, adding necessary matter from news paper. If you prepare in above manner you can answer multiple choice questions, fill in the blanks, what ever may be the question from specified unit you can answer easily. If we observe the question papers of CBSE Exams since two three years Maths &Science questions are illustration based, so we have to give importance to all the topics equally and get complete idea on each and every topic and answer in your own way students should used per examination online tuition facility and clear your counts. If you observe the questions of intermediate,+2, the questions are application oriented . In each subject identify important formulae and practice the questions based on the formulae. Take a break from other competitive exams. Give importance to practice tests and model tests. Take special care in weak subjects. practice is better than reading based preparation in Maths, physics, chemistry . 1. You have to spend ten minutes to read question paper properly . 2. Answer questions from simple to complex. 3. Problems based exams like Maths& physics you have to solve the problems considering time . 4. If you take much time to solve a problem than you require move to next question immediately . 5. In theory subjects answer the question according to the marks . 6. In TS state tenth class exams going to conduct in new pattern so fifteen minutes is given to understand paper. 7. While answering questions think about that particular question and subject . 8. Do not think of marks and grades . 9. Move from simple subject to complex subject you have to answer the questions in your own way related to contemporary issues. 10. You have to develop explanation skills . 11. Think answer in different angles for particular question . Maths questions are based on concepts so understand the concepts properly, revision and techniques will help you. 12. Practice and comparative approach is very important .